TSU Executive MBA students, program dcirector and faculty member visit a shrine during their 11-day global immersion visit to Japan. 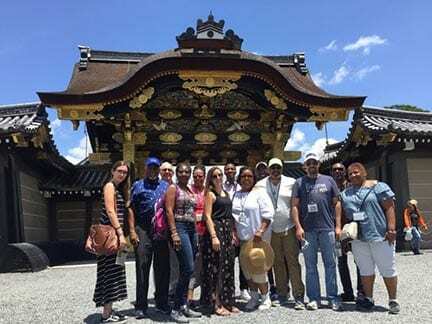 NASHVILLE, TN (TSU News Service) — Participants in Tennessee State University’s Executive MBA program experienced much more than they expected during their recent visit to Japan as part of an 11-day global immersion program. The 10-member group, which returned to the U.S. June 22, were among those who felt the earthquake that registered 6.1 on the Richter scale. TSU Executive MBA global immersion participants gather for a photo during their visit to CMIC Holdings Company in Japan. Seated l-r: Stefania Placentini, Leah Sarnicola, Janet Blakemore, Joyce Barbour, Anita Sykes-Smith and Tonya Kilpatrick. The quake hit the Japanese city of Osaka at about 8:15 a.m., on June 18, the ninth day of the immersion program, but was felt 27 miles away in Kyoto where group members were having breakfast. Fortunately, no one in the group was injured, and they still made the most of their visit. The global immersion program is part of the 12-course inaugural EMBA program intended to give participants real-world, real-life experience of international culture and business operation. A business faculty member, an industry executive board member to the College of Business, and the EMBA program director led the visit. As part of their experience, participants were immersed in the Japanese culture through food cuisine, and visiting historical temples and shrines. They also visited five leading corporations and held discussions on topics such as R&D and emerging trends in the automotive industry; core business and global development strategies and prospects for growth; and communications, public relations and marketing in Japan. Companies visited included Coca Cola, Mitsubishi, the Ritz Carlton, SAMCO and CMIC Holdings. Dr. S. Keith Hargrove, dean of the College of Engineering and a student in the EMBA program, said the global immersion was very enriching. In addition to Kyoto, the group also visited Tokyo, and Kamakura, Nashville’s Japanese sister city. According to Mnif, the global emersion experience is an optional component of the EMBA program. As part of the Global Residency course offered during the summer, program participants have the opportunity to spend 10 days studying outside the United States to broaden their understanding of leadership in a global economy and to experience firsthand the business practices and cultures of a foreign country. For those students who cannot travel, they have the option of taking the Global Challenges Class at TSU, Mnif said. “Japan’s natural barriers of unique heritage, language and business culture and customs create a challenging and positive learning experience for students that sharpen their abilities to operate successfully worldwide,” said Johnson, who is also a former president of TSU. Philip Trella, an Executive In Residence, also accompanied the group. Other EMBA students on the global immersion visit were: Joyce Barbour, Janet Blakemore, Frederick Cawthon, Marrecco Johnson, Tonya Kilpatrick, Stefania Placentini, Leah Sarnicola and Anita Sykes-Smith.